WHAT WE FILIPINOS SHOULD KNOW: Albert J. Beveridge (1862-1937) was elected by individuals in Indiana to the U.S. Senate in 1899. Before assuming his role as a Senator, however, Beveridge had visited the Philippine Islands. During this time in 1899, the Philippines had already legally became the United States’, but there was a great deal of fighting between Americans and Filipino anti-imperialists or nationalists who learned to fight using guerilla warfare. Beveridge was a supporter of the annexation of the Philippines by the United States and thus, in this 1900 address to the Senate, Beveridge explicitly explains why the Philippines should be governed by the United States. Some of the most emphasized reasons that Beveridge includes is that control over the Philippines could provide the U.S. with profitable access to other Asian markets, especially those of China, that God’s mission for Americans was to civilize the world, and that the Filipinos need to be governed because of their supposed barbaric quality and ignorance. Beveridge found the rationale of Social Darwinism to be a useful theme in the argument for expansionism, for American Imperialism. He and his fellow proponents for Philippine annexation/colonization affirmed their Darwinian beliefs: just as the fittest forms of animal life had demonstrated their superiority through survival, great nations like the United States had proven by their triumph over weaker states, their right, and even their responsibility to rule over and civilize others. He maintained that Anglo-Saxon mastery of the world has been preordained by Divine Providence. 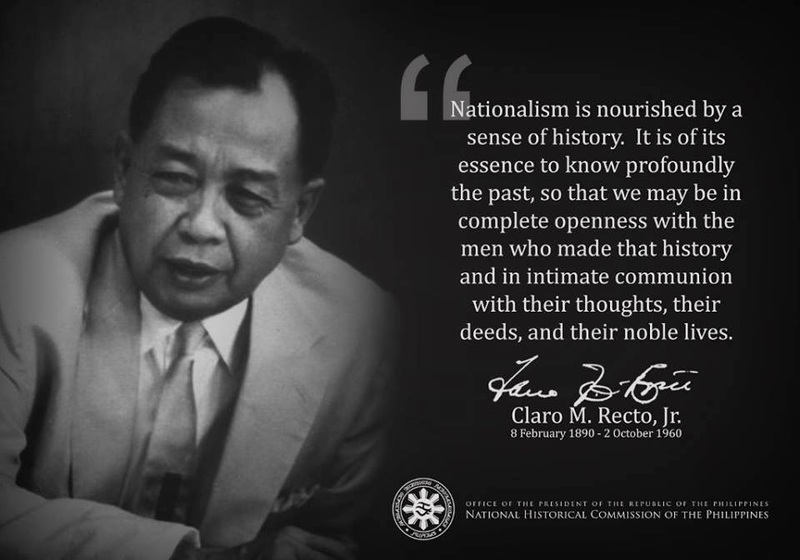 Fast forward to the present, the 50-year American colonization/education period and the current neocolonial situation in our homeland has very successfully conditioned and made us Filipinos, at home and abroad, then and now, to know Philippine history and myths as America wants us; and thus be ignorant of our true history, of our hidden past, to have a "continuing past" as Renato Constantino wrote in the 1960s, to be Americanized, consciously or unconsciously, in thought and deed, mouthing American lines and religiously following American dictates in matters of national and international economic and political concerns, believing that we are incapable for self-government, as Dr. Jose Rizal puts it: "atomized". We are indeed a nation of strangers. Albert J. Beveridge Source: Congressional Record, 56 Cong., I Session, pp. 704-712. MR. PRESIDENT, the times call for candor. The Philippines are ours forever, "territory belonging to the United States," as the Constitution calls them. And just beyond the Philippines are China’s illimitable markets. We will not retreat from either. We will not repudiate our duty in the archipelago. We will not abandon our opportunity in the Orient. We will not renounce our part in the mission of our race, trustee, under God, of the civilization of the world. And we will move forward to our work, not howling out regrets like slaves whipped to their burdens but with gratitude for a task worthy of our strength and thanksgiving to Almighty God that He has marked us as His chosen people, henceforth to lead in the regeneration of the world. This island empire is the last land left in all the oceans. If it should prove a mistake to abandon it, the blunder once made would be irretrievable. If it proves a mistake to hold it, the error can be corrected when we will. Every other progressive nation stands ready to relieve us. But to hold it will be no mistake. Our largest trade henceforth must be with Asia. The Pacific is our ocean. More and more Europe will manufacture the most it needs; secure from its colonies the most it consumes. Where shall we turn for consumers of our surplus? Geography answers the question. China is our natural customer. She is nearer to us than to England, Germany, or Russia, the commercial powers of the present and the future. They have moved nearer to China by securing permanent bases on her borders. The Philippines give us a base at the door of all the East. Lines of navigation from our ports to the Orient and Australia, from the Isthmian Canal to Asia, from all Oriental ports to Australia converge at and separate from the Philippines. They are a self-supporting, dividend-paying fleet, permanently anchored at a spot selected by the strategy of Providence, commanding the Pacific. And the Pacific is the ocean of the commerce of the future. Most future wars will be conflicts for commerce. The power that rules the Pacific, therefore, is the power that rules the world. And, with the Philippines, that power is and will forever be the American Republic. . . . But if they did not command China, India, the Orient, the whole Pacific for purposes of offense, defense, and trade, the Philippines are so valuable in themselves that we should hold them. I have cruised more than 2,000 miles through the archipelago, every moment a surprise at its loveliness and wealth. I have ridden hundreds of miles on the islands, every foot of the way a revelation of vegetable and mineral riches. . . Here, then, senators, is the situation. Two years ago there was no land in all the world which we could occupy for any purpose. Our commerce was daily turning toward the Orient, and geography and trade developments made necessary our commercial empire over the Pacific. And in that ocean we had no commercial, naval, or military base. Today, we have one of the three great ocean possessions of the globe, located at the most commanding commercial, naval, and military points in the Eastern seas, within hail of India, shoulder to shoulder with China, richer in its own resources than any equal body of land on the entire globe, and peopled by a race which civilization demands shall be improved. Shall we abandon it? That man little knows the common people of the republic, little understands the instincts of our race who thinks we will not hold it fast and hold it forever, administering just government by simplest methods. We may trick up devices to shift our burden and lessen our opportunity; they will avail us nothing but delay. We may tangle conditions by applying academic arrangements of self-government to a crude situation; their failure will drive us to our duty in the end. The military situation, past, present, and prospective, is no reason for abandonment. Our campaign has been as perfect as possible with the force at hand. We have been delayed, first, by a failure to comprehend the immensity of our acquisition; and, second, by insufficient force; and, third, by our efforts for peace. In February, after the treaty of peace, General Otis had only 3,722 officers and men whom he had a legal right to order into battle. The terms of enlistment of the rest of his troops had expired, and they fought voluntarily and not on legal military compulsion. It was one of the noblest examples of patriotic devotion to duty in the history of the world. Those who complain do so in ignorance of the real situation. We attempted a great task with insufficient means; we became impatient that it was not finished before it could fairly be commenced; and I pray we may not add that other element of disaster, pausing in the work before it is thoroughly and forever done. That is the gravest mistake we could possibly make, and that is the only danger before us. Our Indian wars would have been shortened, the lives of soldiers and settlers saved, and the Indians themselves benefited had we made continuous and decisive war; and any other kind of war is criminal because ineffective. We acted toward the Indians as though we feared them, loved them, hated them - a mingling of foolish sentiment, inaccurate thought, and paralytic purpose. . . .
Mr. President that must not be our plan. This war is like all other wars. It needs to be finished before it is stopped. I am prepared to vote either to make our work thorough or even now to abandon it. A lasting peace can be secured only by overwhelming forces in ceaseless action until universal and absolutely final defeat is inflicted on the enemy. To halt before every armed force, every guerrilla band opposing us is dispersed or exterminated will prolong hostilities and leave alive the seeds of perpetual insurrection. Even then we should not treat. To treat at all is to admit that we are wrong. And any quiet so secured will be delusive and fleeting. And a false peace will betray us; a sham truce will curse us. It is not to serve the purposes of the hour; it is not to salve a present situation that peace should be established. It is for the tranquillity of the archipelago forever. It is for an orderly government for the Filipinos for all the future. It is to give this problem to posterity solved and settled, not vexed and involved. It is to establish the supremacy of the American republic over the Pacific and throughout the East till the end of time. It has been charged that our conduct of the war has been cruel. Senators, it has been the reverse. I have been in our hospitals and seen the Filipino wounded as carefully, tenderly cared for as our own. Within our lines they may plow and sow and reap and go about the affairs of peace with absolute liberty. And yet all this kindness was misunderstood, or rather not understood. Senators must remember that we are not dealing with Americans or Europeans. We are dealing with Orientals. We are dealing with Orientals who are Malays. We are dealing with Malays instructed in Spanish methods. They mistake kindness for weakness, forbearance for fear. It could not be otherwise unless you could erase hundreds of years of savagery, other hundreds of years of Orientalism, and still other hundreds of years of Spanish character and custom. . .
Mr. President, reluctantly and only from a sense of duty am I forced to say that American opposition to the war has been the chief factor in prolonging it. Had Aguinaldo not understood that in America, even in the American Congress, even here in the Senate, he and his cause were supported; had he not known that it was proclaimed on the stump and in the press of a faction in the United States that every shot his misguided followers fired into the breasts of American soldiers was like the volleys fired by Washington’s men against the soldiers of King George, his insurrection would have dissolved before it entirely crystallized. The utterances of American opponents of the war are read to the ignorant soldiers of Aguinaldo and repeated in exaggerated form among the common people. Attempts have been made by wretches claiming American citizenship to ship arms and ammunition from Asiatic ports to the Filipinos, and these acts of infamy were coupled by the Malays with American assaults on our government at home. The Filipinos do not understand free speech, and therefore our tolerance of American assaults on the American President and the American government means to them that our President is in the minority or he would not permit what appears to them such treasonable criticism. It is believed and stated in Luzon, Panay, and Cebu that the Filipinos have only to fight, harass, retreat, break up into small parties, if necessary, as they are doing now, but by any means hold out until the next presidential election, and our forces will be withdrawn. All this has aided the enemy more than climate, arms, and battle. Senators, I have heard these reports myself; I have talked with the people; I have seen our mangled boys in the hospital and field; I have stood on the firing line and beheld our dead soldiers, their faces turned to the pitiless southern sky, and in sorrow rather than anger I say to those whose voices in America have cheered those misguided natives on to shoot our soldiers down, that the blood of those dead and wounded boys of ours is on their hands, and the flood of all the years can never wash that stain away. In sorrow rather than anger I say these words, for I earnestly believe that our brothers knew not what they did. But, senators, it would be better to abandon this combined garden and Gibraltar of the Pacific, and count our blood and treasure already spent a profitable loss than to apply any academic arrangement of self-government to these children. They are not capable of self-government. How could they be? They are not of a self-governing race. They are Orientals, Malays, instructed by Spaniards in the latter’s worst estate. They know nothing of practical government except as they have witnessed the weak, corrupt, cruel, and capricious rule of Spain. What magic will anyone employ to dissolve in their minds and characters those impressions of governors and governed which three centuries of misrule has created? What alchemy will change the Oriental quality of their blood and set the self-governing currents of the American pouring through their Malay veins? How shall they, in the twinkling of an eye, be exalted to the heights of self-governing peoples which required a thousand years for us to reach, Anglo-Saxon though we are? Let men beware how they employ the term "self-government." It is a sacred term. It is the watchword at the door of the inner temple of liberty, for liberty does not always mean self-government. Self-government is a method of liberty - the highest, simplest, best - and it is acquired only after centuries of study and struggle and experiment and instruction and all the elements of the progress of man. Self-government is no base and common thing to be bestowed on the merely audacious. It is the degree which crowns the graduate of liberty, not the name of liberty’s infant class, who have not yet mastered the alphabet of freedom. Savage blood, Oriental blood, Malay blood, Spanish example - are these the elements of self-government? We must act on the situation as it exists, not as we would wish it. I have talked with hundreds of these people, getting their views as to the practical workings of self-government. The great majority simply do not understand any participation in any government whatever. The most enlightened among them declare that self-government will succeed because the employers of labor will compel their employees to vote as their employer wills and that this will insure intelligent voting. I was assured that we could depend upon good men always being in office because the officials who constitute the government will nominate their successors, choose those among the people who will do the voting, and determine how and where elections will be held. The most ardent advocate of self-government that I met was anxious that I should know that such a government would be tranquil because, as he said, if anyone criticized it, the government would shoot the offender. A few of them have a sort of verbal understanding of the democratic theory, but the above are the examples of the ideas of the practical workings of self-government entertained by the aristocracy, the rich planters and traders, and heavy employers of labor, the men who would run the government. . . . In all other islands our government must be simple and strong. It must be a uniform government. Different forms for different islands will produce perpetual disturbance because the people of each island would think that the people of the other islands are more favored than they. In Panay I heard murmurings that we were giving Negros an American constitution. This is a human quality, found even in America, and we must never forget that in dealing with the Filipinos we deal with children. And so our government must be simple and strong. Simple and strong! The meaning of those two words must be written in every line of Philippine legislation, realized in every act of Philippine administration. A Philippine office in our Department of State; an American governor-general in Manila, with power to meet daily emergencies; possibly an advisory council with no power except that of discussing measures with the governor-general, which council would be the germ for future legislatures, a school in practical government; American lieutenant governors in each province, with a like council about him if possible, an American resident in each district and a like council grouped about him. Frequent and unannounced visits of provincial governors to the districts of their province; periodical reports to the governor-general; an American board of visitation to make semiannual trips to the archipelago without power of suggestion or interference to officials or people, but only to report and recommend to the Philippine office of our State Department; a Philippine civil service, with promotion for efficiency; the abolition of duties on exports from the Philippines; the establishment of import duties on a revenue basis, with such discrimination in favor of American imports as will prevent the cheaper goods of other nations from destroying American trade; a complete reform of local taxation on a just and scientific basis, beginning with the establishment of a tax on land according to its assessed value; the minting of abundant money for Philippine and Oriental use. The granting of franchises and concessions upon the theory of developing the resources of the archipelago, and therefore not by sale, but upon participation in the profits of the enterprise; the formation of a system of public schools everywhere with compulsory attendance rigidly enforced; the establishment of the English language throughout the Islands, teaching it exclusively in the schools and using it, through interpreters, exclusively in the courts; a simple civil code and a still simpler criminal code, and both common to all the islands except Sulu, Mindanao, and Paluan; American judges for all but smallest offenses; gradual, slow, and careful introduction of the best Filipinos into the working machinery of the government, no promise whatever of the franchise until the people have been prepared for it, all this backed by the necessary force to execute it - this outline of government the situation demands as soon as tranquillity is established. Until then military government is advisable. . . . The men we send to administer civilized government in the Philippines must be themselves the highest examples of our civilization. I use the word "examples," for examples they must be in that word’s most absolute sense. They must be men of the world and of affairs, students of their fellowmen, not theorists nor dreamers. They must be brave men, physically as well as morally. They must be as incorruptible as honor, as stainless as purity, men whom no force can frighten, no influence coerce, no money buy. Such men come high, even here in America. But they must be had. Better pure military occupation for years than government by any other quality of administration. Better abandon this priceless possession, admit ourselves incompetent to do our part in the world-redeeming work of our imperial race; better now haul down the flag of arduous deeds for civilization and run up the flag of reaction and decay than to apply academic notions of self-government to these children or attempt their government by any but the most perfect administrators our country can produce. I assert that such administrators can be found. . . .
Mr. President, self-government and internal development have been the dominant notes of our first century; administration and the development of other lands will be the dominant notes of our second century. And administration is as high and holy a function as self-government, just as the care of a trust estate is as sacred an obligation as the management of our own concerns. Cain was the first to violate the divine law of human society which makes of us our brother’s keeper. And administration of good government is the first lesson in self-government, that exalted estate toward which all civilization tends. Administration of good government is not denial of liberty. For what is liberty? It is not savagery. It is not the exercise of individual will. It is not dictatorship. It involves government, but not necessarily self-government. It means law. First of all, it is a common rule of action, applying equally to all within its limits. Liberty means protection of property and life without price, free speech without intimidation, justice without purchase or delay, government without favor or favorites. What will best give all this to the people of the Philippines - American administration, developing them gradually toward self-government, or self-government by a people before they know what self-government means? The Declaration of Independence does not forbid us to do our part in the regeneration of the world. If it did, the Declaration would be wrong, just as the Articles of Confederation, drafted by the very same men who signed the Declaration, was found to be wrong. The Declaration has no application to the present situation. It was written by self-governing men for self-governing men. It was written by men who, for a century and a half, had been experimenting in self-government on this continent, and whose ancestors for hundreds of years before had been gradually developing toward that high and holy estate. The Declaration applies only to people capable of self-government. How dare any man prostitute this expression of the very elect of self-governing peoples to a race of Malay children of barbarism, schooled in Spanish methods and ideas? And you who say the Declaration applies to all men, how dare you deny its application to the American Indian? And if you deny it to the Indian at home, how dare you grant it to the Malay abroad? The Declaration does not contemplate that all government must have the consent of the governed. It announces that man’s "inalienable rights are life, liberty, and the pursuit of happiness; that to secure these rights governments are established among men deriving their just powers from the consent of the governed; that when any form of government becomes destructive of those rights, it is the right of the people to alter or abolish it." "Life, liberty, and the pursuit of happiness" are the important things; "consent of the governed" is one of the means to those ends. If "any form of government becomes destructive of those ends, it is the night of the people to alter or abolish it," says the Declaration. "Any forms" includes all forms. Thus the Declaration itself recognizes other forms of government than those resting on the consent of the governed The word "consent" itself recognizes other forms, for "consent" means the understanding of the thing to which the "consent" is given; and there are people in the world who do not understand any form of government. And the sense in which "consent" is used in the Declaration is broader than mere understanding; for "consent" in the Declaration means participation in the government "consented" to. And yet these people who are not capable of "consenting" to any form of government must be governed. And so the Declaration contemplates all forms of government which secure the fundamental rights of life, liberty, and the pursuit of happiness. Self-government, when that will best secure these ends, as in the case of people capable of self-government; other appropriate forms when people are not capable of self-government. And so the authors of the Declaration themselves governed the Indian without his consent; the inhabitants of Louisiana without their consent; and ever since the sons of the makers of the Declaration have been governing not by theory but by practice, after the fashion of our governing race, now by one form, now by another, but always for the purpose of securing the great eternal ends of life, liberty, and the pursuit of happiness, not in the savage but in the civilized meaning of those terms - life, according to orderly methods of civilized society; liberty regulated by law; pursuit of happiness limited by the pursuit of happiness by every other man. If this is not the meaning of the Declaration, our government itself denies the Declaration every time it receives the representative of any but a republican form of government, such as that of the sultan, the czar, or other absolute autocrats, whose governments, according to the opposition’s interpretation of the Declaration, are spurious governments because the people governed have not "consented" to them. Senators in opposition are stopped from denying our constitutional power to govern the Philippines as circumstances may demand, for such power is admitted in the case of Florida, Louisiana, Alaska. How, then, is it denied in the Philippines? Is there a geographical interpretation to the Constitution? Do degrees of longitude fix constitutional limitations? Does a thousand miles of ocean diminish constitutional power more than a thousand miles of land? The ocean does not separate us from the field of our duty and endeavor - it joins us, an established highway needing no repair and landing us at any point desired. The seas do not separate the Philippine Islands from us or from each other. The seas are highways through the archipelago, which would cost hundreds of millions of dollars to construct if they were land instead of water. Land may separate men from their desire; the ocean, never. Russia has been centuries in crossing Siberian wastes; the Puritans cross the Atlantic in brief and flying weeks. If the Boers must have traveled by land, they would never have reached the Transvaal; but they sailed on liberty’s ocean; they walked on civilization’s untaxed highway, the welcoming sea. Our ships habitually sailed round the Cape and anchored in California’s harbors before a single trail had lined the desert with the whitening bones of those who made it. No! No! The ocean unites us; steam unites us; electricity unites us; all the elements of nature unite us to the region where duty and interest call us. There is in the ocean no constitutional argument against the march of the flag, for the oceans, too, are ours. With more extended coastlines than any nation of history; with a commerce vaster than any other people ever dreamed of, and that commerce as yet only in its beginnings; with naval traditions equaling those of England or of Greece, and the work of our Navy only just begun; with the air of the ocean in our nostrils and the blood of a sailor ancestry in our veins; with the shores of all the continents calling us, the Great Republic before I die will be the acknowledged lord of the world’s high seas. And over them the republic will hold dominion, by virtue of the strength God has given it, for the peace of the world and the betterment of man. No; the oceans are not limitations of the power which the Constitution expressly gives Congress to govern all territory the nation may acquire. The Constitution declares that "Congress shall have power to dispose of and make all needful rules and regulations respecting the territory belonging to the United States." Not the Northwest Territory only; not Louisiana or Florida only; not territory on this continent only but any territory anywhere belonging to the nation. The founders of the nation were not provincial. Theirs was the geography of the world. They were soldiers as well as landsmen, and they knew that where our ships should go our flag might follow. They had the logic of progress, and they knew that the republic they were planting must, in obedience to the laws of our expanding race, necessarily develop into the greater republic which the world beholds today, and into the still mightier republic which the world will finally acknowledge as the arbiter, under God, of the destinies of mankind. And so our fathers wrote into the Constitution these words of growth, of expansion, of empire, if you will, unlimited by geography or climate or by anything but the vitality and possibilities of the American people: "Congress shall have power to dispose of and make all needful rules and regulations respecting the territory belonging to the United States." The power to govern all territory the nation may acquire would have been in Congress if the language affirming that power had not been written in the Constitution; for not all powers of the national government are expressed. Its principal powers are implied. The written Constitution is but the index of the living Constitution. Had this not been true, the Constitution would have failed; for the people in any event would have developed and progressed. And if the Constitution had not had the capacity for growth corresponding with the growth of the nation, the Constitution would and should have been abandoned as the Articles of Confederation were abandoned. For the Constitution is not immortal in itself, is not useful even in itself. The Constitution is immortal and even useful only as it serves the orderly development of the nation. The nation alone is immortal. The nation alone is sacred. The Army is its servant. The Navy is its servant. The President is its servant. This Senate is its servant. Our laws are its methods. Our Constitution is its instrument. . . .
Mr. President, this question is deeper than any question of party politics; deeper than any question of the isolated policy of our country even; deeper even than any question of constitutional power. It is elemental. It is racial. God has not been preparing the English-speaking and Teutonic peoples for a thousand years for nothing but vain and idle self-contemplation and self-admiration. No! He has made us the master organizers of the world to establish system where chaos reigns. He has given us the spirit of progress to overwhelm the forces of reaction throughout the earth. He has made us adepts in government that we may administer government among savage and senile peoples. Were it not for such a force as this the world would relapse into barbarism and night. And of all our race He has marked the American people as His chosen nation to finally lead in the regeneration of the world. This is the divine mission of America, and it holds for us all the profit, all the glory, all the happiness possible to man. We are trustees of the world’s progress, guardians of its righteous peace. The judgment of the Master is upon us: "Ye have been faithful over a few things; I will make you ruler over many things." What shall history say of us? Shall it say that we renounced that holy trust, left the savage to his base condition, the wilderness to the reign of waste, deserted duty, abandoned glory, forget our sordid profit even, because we feared our strength and read the charter of our powers with the doubter’s eye and the quibbler’s mind? Shall it say that, called by events to captain and command the proudest, ablest, purest race of history in history’s noblest work, we declined that great commission? Our fathers would not have had it so. No! They founded no paralytic government, incapable of the simplest acts of administration. They planted no sluggard people, passive while the world’s work calls them. They established no reactionary nation. They unfurled no retreating flag. That flag has never paused in its onward march. Who dares halt it now - now, when history’s largest events are carrying it forward; now, when we are at last one people, strong enough for any task, great enough for any glory destiny can bestow? How comes it that our first century closes with the process of consolidating the American people into a unit just accomplished, and quick upon the stroke of that great hour presses upon us our world opportunity, world duty, and world glory, which none but the people welded into an invisible nation can achieve or perform? Blind indeed is he who sees not the hand of God in events so vast, so harmonious, so benign. Reactionary indeed is the mind that perceives not that this vital people is the strongest of the saving forces of the world; that our place, therefore, is at the head of the constructing and redeeming nations of the earth; and that to stand aside while events march on is a surrender of our interests, a betrayal of our duty as blind as it is base. Craven indeed is the heart that fears to perform a work so golden and so noble; that dares not win a glory so immortal. Do you tell me that it will cost us money? When did Americans ever measure duty by financial standards? Do you tell me of the tremendous toil required to overcome the vast difficulties of our task? What mighty work for the world, for humanity, even for ourselves has ever been done with ease? Even our bread must we eat by the sweat of our faces. Why are we charged with power such as no people ever knew if we are not to use it in a work such as no people ever wrought? Who will dispute the divine meaning of the fable of the talents? Do you remind me of the precious blood that must be shed, the lives that must be given, the broken hearts of loved ones for their slain? And this is indeed a heavier price than all combined. And, yet, as a nation, every historic duty we have done, every achievement we have accomplished has been by the sacrifice of our noblest sons. Every holy memory that glorifies the flag is of those heroes who have died that its onward march might not be stayed. It is the nation’s dearest lives yielded for the flag that makes it dear to us; it is the nation’s most precious blood poured out for it that makes it precious to us. That flag is woven of heroism and grief, of the bravery of men and women’s tears, of righteousness and battle, of sacrifice and anguish, of triumph and of glory. It is these which make our flag a holy thing. Who would tear from that sacred banner the glorious legends of a single battle where it has waved on land or sea? What son of a soldier of the flag whose father fell beneath it on any field would surrender that proud record for the heraldry of a king? In the cause of civilization, in the service of the republic anywhere on earth, Americans consider wounds the noblest decorations man can win, and count the giving of their lives a glad and precious duty. Pray God that spirit never falls. Pray God the time may never come when Mammon and the love of ease shall so debase our blood that we will fear to shed it for the flag and its imperial destiny. Pray God the time may never come when American heroism is but a legend like the story of the Cid. American faith in our mission and our might a dream dissolved, and the glory of our mighty race departed. And that time will never come. We will renew our youth at the fountain of new and glorious deeds. We will exalt our reverence for the flag by carrying it to a noble future as well as by remembering its ineffable past. Its immortality will not pass, because everywhere and always we will acknowledge and discharge the solemn responsibilities our sacred flag, in its deepest meaning, puts upon us. And so, senators, with reverent hearts, where dwells the fear of God, the American people move forward to the future of their hope and the doing of His work. Mr. President and senators, adopt the resolution offered that peace may quickly come and that we may begin our saving, regenerating, and uplifting work. Adopt it, and this bloodshed will cease when these deluded children of our islands learn that this is the final word of the representatives of the American people in Congress assembled. Reject it, and the world, history, and the American people will know where to forever fix the awful responsibility for the consequences that will surely follow such failure to do our manifest duty. How dare we delay when our soldiers’ blood is flowing?